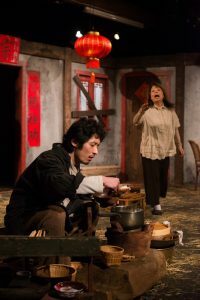 Te Pou’s language-spanning season of The Chairs ends with an exemplary Cantonese version of the play. The prescriptiveness of Eugene Ionesco’s text is respectfully toyed with, recontextualising the space for a traditional Chinese context. Those with even only the slightest understanding of the culture will find resonances in abundance. The basic scenario stays true to the original text, with an Old Man (Sam Wang) and Old Woman (Audrey Chan) making preparations for The Orator (Mustaq Missouri), a special guest invited to pass on their message to the world before they leave it behind – though not before visits from numerous guests, old friends and associates who we never see. Are they simply delusions, ghosts from the past, or something in between? In this interpretation, the fine and fluid translation by Henry Liu accentuates the formal aspects of Cantonese banter, from the specific rhythms of politeness to the familiar, everyday idioms. As an inevitability of the age difference between the central couple, there is a distinct lack of romantic longing. But in place of that is a playful familiarity, especially as we watch the pair bounce back and forth with the ping-pong rhythms of Hong Kong screwball comedy. Wang gives a particularly dexterous and physical performance, making surprise entrances and exits with a clownish, slapstick perfection. Those familiar with the films of Stephen Chow (Shaolin Soccer, Kung Fu Hustle) will recognise shades of his famously goofy protagonists. On a purely aural level, his clearly native Mandarin tongue obfuscates the clarity of the Cantonese script at times, even if his delivery often compensates. In a more naturalistic drama this would pose a bigger problem, but in a season of absurdist work that is framed for the viewing experiences of both native and non-native speakers, the collision between the two Chinese dialects becomes fittingly bizarre. One just wishes surtitles were provided to give the full experience. Chan is a quiet revelation as the Old Woman, embodying the longing and wistfulness of old age, along with the innocent joy of it too. A visit from an old crush is played with pitch-perfect coquettishness, sending the character into a charmingly schoolgirl state. In the play’s more tragic moments, the lilt of her delivery often strikes a powerfully melancholic note, masked by a sweet, stoic smile. As The Orator, Missouri’s presence is somewhat jarring as his character feels very much from a different play, his post-apocalyptic outfit more at home in the worlds of Mad Max or Mortal Kombat. 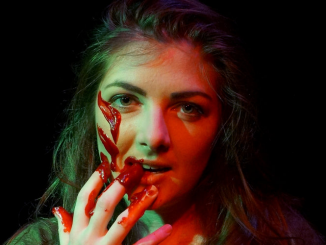 But the character’s muteness is played with a stirring, violent desperation. A final, muffled cry in this search for meaning. The set design by Henric Mattheisen is a beautifully constructed artwork, featuring microscopic details and an immaculate mise en scène. Harking back to the crumbling ancestral estates of China, it evokes ghosts of the past effortlessly. The looming threat of modernism and our contemporary age is palpable. Perhaps ATC’s recent production of The Cherry Orchard can be blamed, but I can’t seem to shake the Chekhov parallels from my mind. What strikes me as the greatest strength and success of the project is the potential to elucidate the shared commonalities between Ionesco’s sensibilities and the new cultural context they inhabit. While I can’t speak for the success of the other versions throughout the season, Hweiling Ow’s direction displays an uncannily perfect match between French absurdism and the rituals and traditions of a bygone Chinese era. These universal themes have never been clearer. A reminder that no matter how hard we try, some things will be lost forever. Te Pou’s final show in the quadruple season of Ionesco’s The Chairs is a culturally rich, deeply entertaining, and thought-provoking dramatic triumph, proving that theatrical storytelling can move far beyond linguistic barriers. Directed by Hweiling Ow, this production faced some significant challenges in its journey from page to stage. With one of its actors not speaking Cantonese, another having little theatre acting experience, and Ow herself using subtitles to direct, this team really had their work cut out. The result of their hard graft is a highly accomplished offering that shows incredible attention to detail and a profound interpretation of the original script. Sam Wang (as the not-so-Old Man) is a hugely energetic and generous performer, to the untrained ear speaking entirely fluent Cantonese. His somatically articulate stage presence lithely complements Audrey Chan’s outwardly halting, consciously ‘older’ and yet more child-like physical frustrations with her surroundings – in a way that speaks of a tender and yet difficult relationship between the couple. Both belong to the space and maintain their respective and opposite energies to convey a feeling that the rest of the world has left them behind – a reality which both isolates and binds them together. The choice to give Ionesco’s Old Man’s dialogue to Chan, and Old Woman’s dialogue to Wang really pays off, serving the relationship between performers with intelligence and nuance. 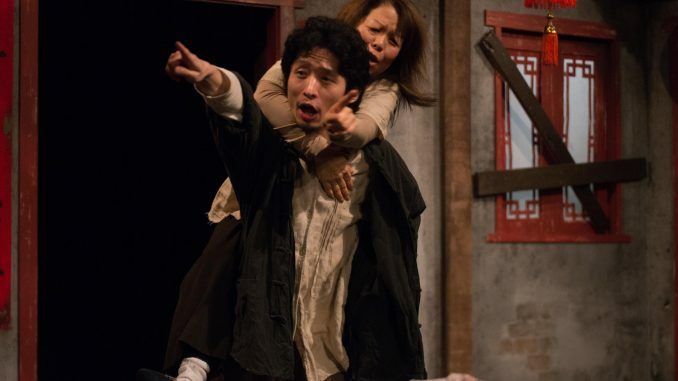 Set in a stunningly designed derelict Ancestral Hall – the centre of any Cantonese village, the programme helps us to understand – a story at turns comic, pensive, mournful and socially articulate unfurls. Henric Matthieson’s design is one of the most detailed and craftmanly sets Te Pou has ever seen [Editor: fitting perhaps as this marks Te Pou’s last show in this venue before they move to Corban Estate] – peeling paint and plaster reveal worn bricks on the walls while Cantonese characters above the doorway praise ancestors and bless their descendants. Joss sticks smoke gently in a traditional shrine and a moulting hay bale immediately creates a dilapidated atmosphere. Traditional cooking pots and pans produce a real rice meal during the opening scene. There’s a realism in the texture of this show that brings an immediacy to the play’s absurd action, in a way that pushes the meaning of the show closer to us, somehow, than did the flamboyant clowning of the Pākehā rendition, or the mannerisms of mask in the Te Reo Māori inception. We are asked to confront the absurdity of the mind itself. 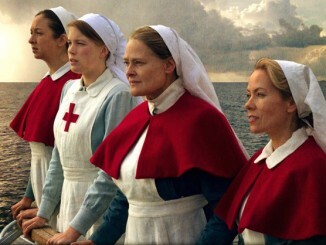 This production comes across as a thoroughly conceived directorial vision: an older wife and her younger husband – whose relationship evokes mother-son qualities in its representation of care-giving and taking – find themselves the last caretakers, not just of one another, but of their Ancestral Hall, after the rest of their village have emigrated for new lives overseas. 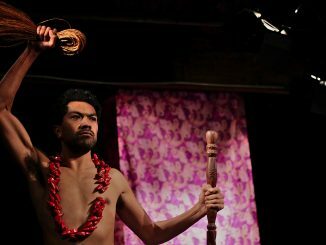 Themes of age, loss, memory and the slow dissolution of life’s vitality speak at a visceral level through the show’s embrace of multi-layered storytelling – dynamic movement articulate beats such that tone speaks above language, while Chez Marama’s lighting design plays its most eloquent role yet in the season. Photographs on the walls of the Hall, honouring those who have passed, aid the storytelling of the couple’s lost son. Athough we are never sure of the truth of this story, the cold blue shifts in the sensitive lighting design convey a grief that is true in itself, regardless of its basis. The suggested instability of the Old Woman’s mental coherence, which these lighting changes also emotively support, make for a haunting evocation of dementia. Everything builds towards a feeling of the dissipation of logical meaning. Reflecting a dissipation of people, this brings a sadder, more seriously bittersweet flavour to the absurd comedy of The Chairs than the previous interpretations. Nevertheless, it’s every bit as captivating as the others. In every inception of The Chairs – we have seen two people welcome guests with good intentions. In every inception we have seen two people dealing with the imperfections of their relationship to one another and with life’s evasion of any particular meaning. Mustaq Missouri’s appearance as a muzzled Orator in this rendition makes a bold play to the tragic irony in Ionesco’s writing, and also to the specific directorial vision here – as a cultural outsider in the Hall, his presence echoes the idea that traditions are dissolving and giving way to a new reality that is disorienting. As the couple make their exit we hear them plunge into the water surrounding the Hall – another meticulous detail that asks us to question the grounding of both the naturalism and absurdism that play more equal roles in this inception of The Chairs. All in all, a stunning close to a fascinating season. 等凳 – The Chairs – Cantonese Season plays at Te Pou until 4 August.